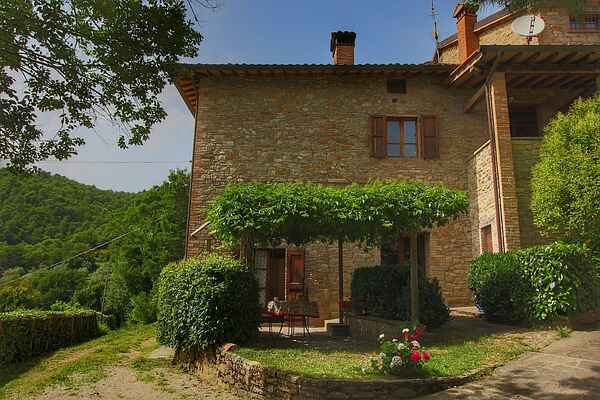 This nice, traditional agriturismo lies near the 700 meters high Monte Santa Maria Teberina. This hill offers a beautiful view across the Tevere valley between Umbria and Tuscany. The agriturismo is an old stone farmhouse with 7 apartments and 3 holiday homes for the guests. There is a panoramic swimming pool, a horseback riding school and a host of nice walks to choose from. The owners love horses and can teach riding lessons. They can also organise longer tours for experienced riders. The agriturismo is set on 50-acre grounds, partially on hilly terrain. You'll find olive trees and vineyards here. The agriturismo also sells local products such as honey, olive oil and wine. The sofa bed is suitable for children under 12 years. At restaurant Oscari can you dine. The elegant restaurant is in Via Roma in Monte Santa Maria Tiberina. The village of Monte Santa Maria Tiberina is situated in the valley of the river Aggi. It through a panoramic position. There are beautiful buildings and take a look at the castle. Do you like modern art? Then we recommend the Fondazione Palazzo Albizzini with the collection of A. Burri. Special and interesting! www.fondazioneburri.org Abbey Badia Petroia (www.badiapetroiaonline.it) is a small part of the town of Città di Castello. Very nice to see!